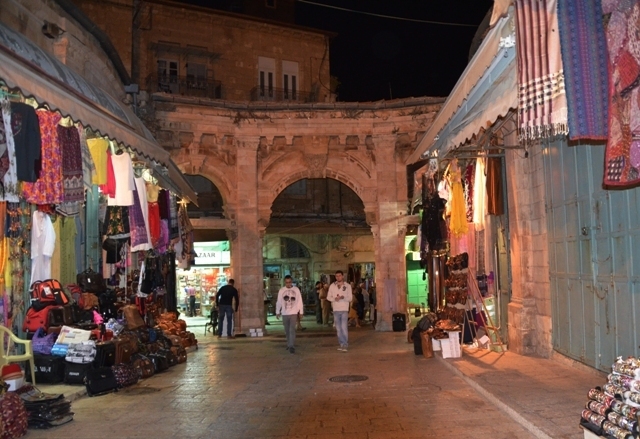 visitors to come at night to the streets of the Old City of Jerusalem, Israel. 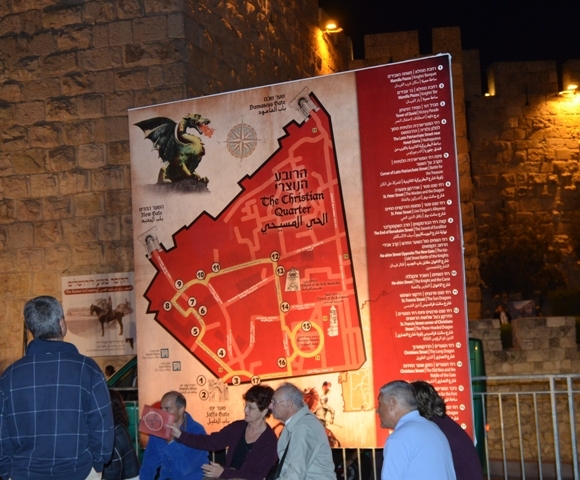 And the current ‘Festival of Knights in the Old City’ has done the job. but does not include the many moving ‘photo ops’. as good photographs are hard to get at these crowded events. 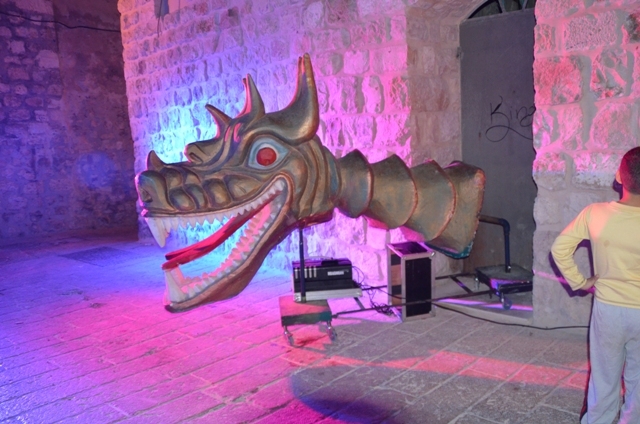 Near the beginning of the route was this colorful dragon head. 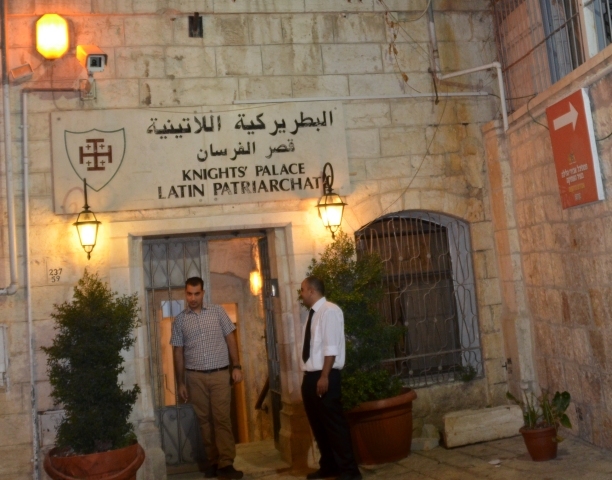 near the real Knights’ Palace. but most were well-lit and many costumes added color. 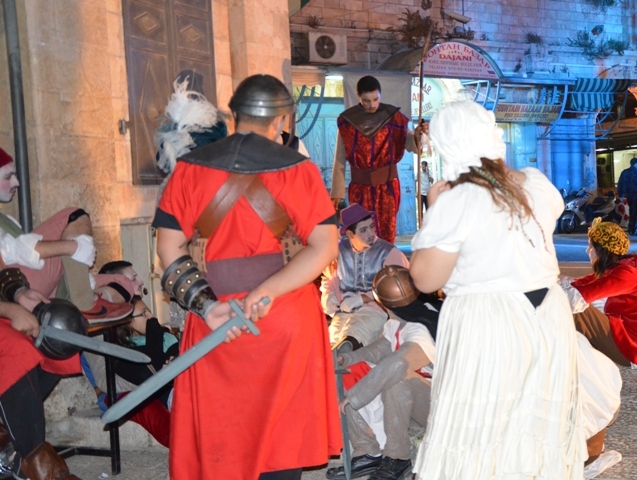 Actors were ready for the shows to begin. which pointed to the actors getting ready in Muristan Square. As I said, smart people took a map. 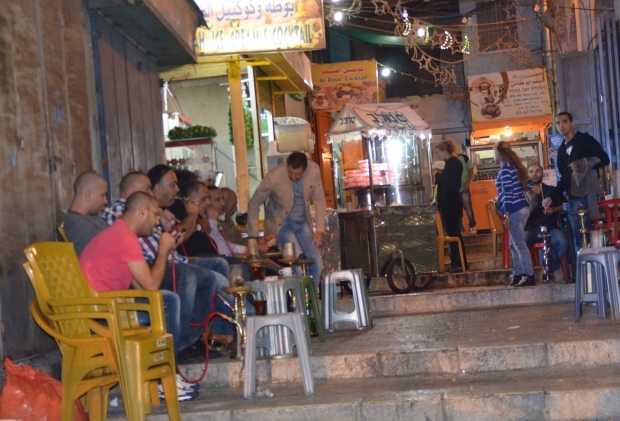 but this was the first night of Eid Al-Adha, the Muslim ‘Feast of Sacrifice’. that I did not get a photo of the smelly animal being pushed in a cart. His sad eyes seemed to know he was going to be the feast. 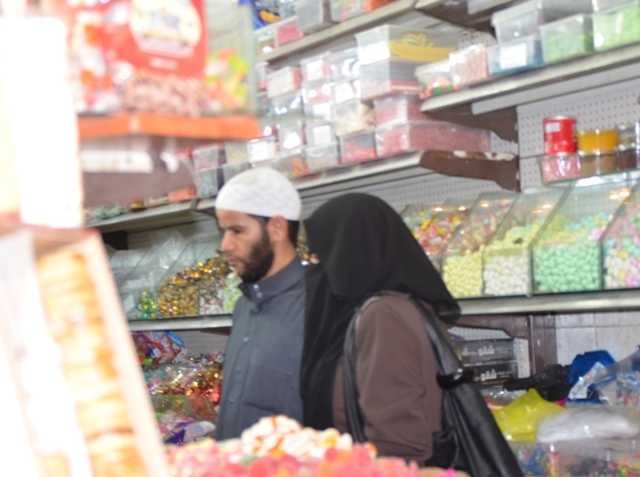 I got only this one picture of a candy store. 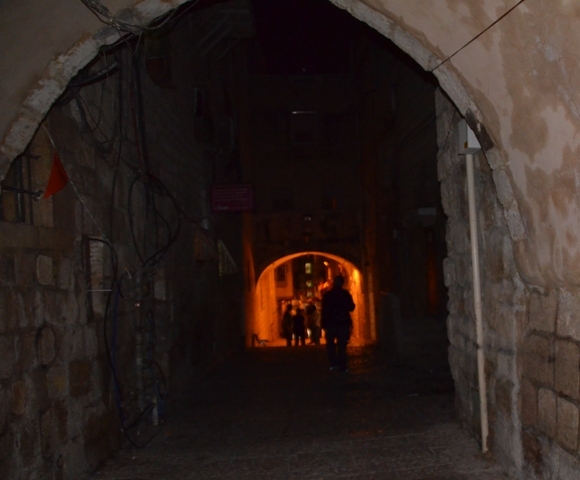 spotting a sign to the Via Dolorosa, I headed out of the Muslim Quarter. the lane was dark and quiet for festival visitors. 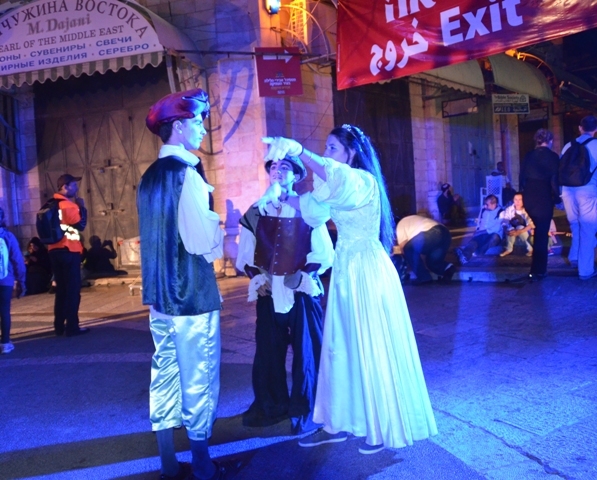 The actors were in Muristan Square and so was the “EXIT” sign. 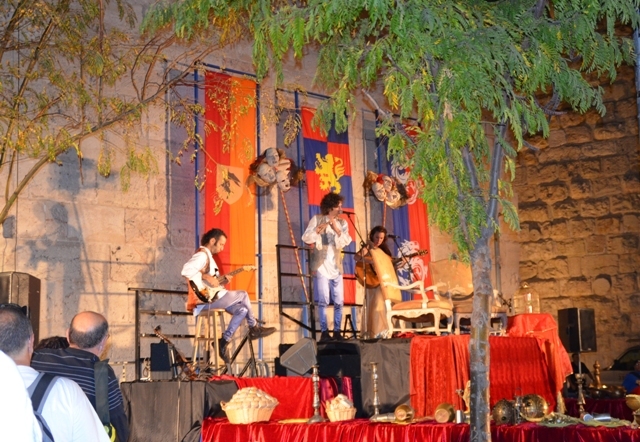 than for the first night of the Festival in October 2010.
seemed to be enjoying themselves. 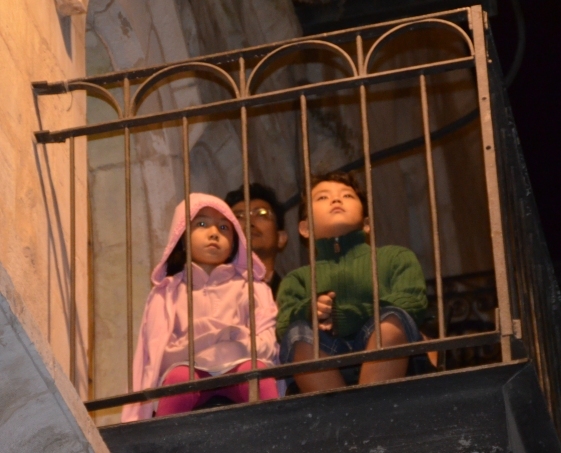 as it was very hard to see the performers. but I think this family had the best view. 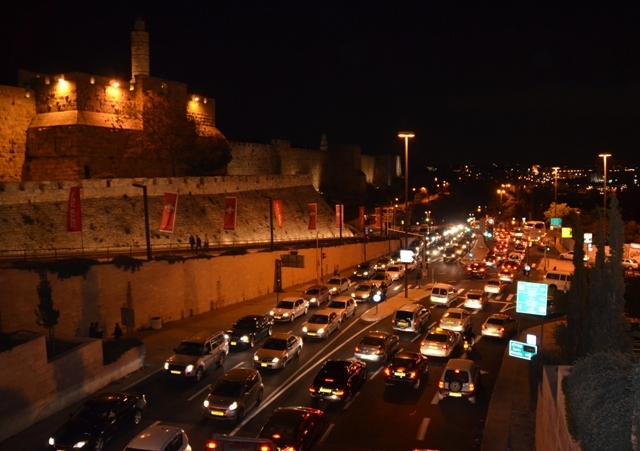 the Jerusalem streets fill with traffic in all directions. 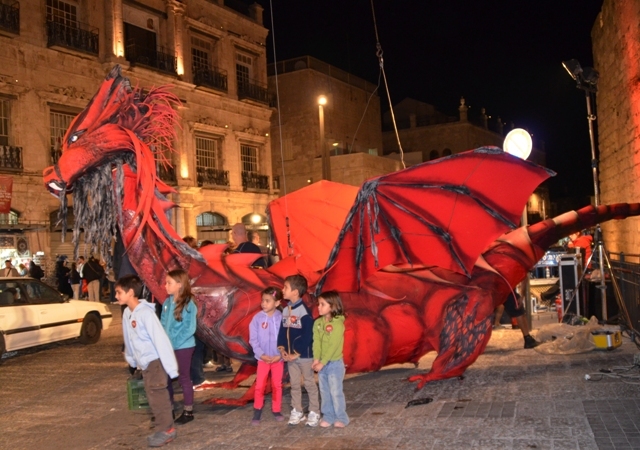 There are still two more Thursday nights in November to enjoy the festival. 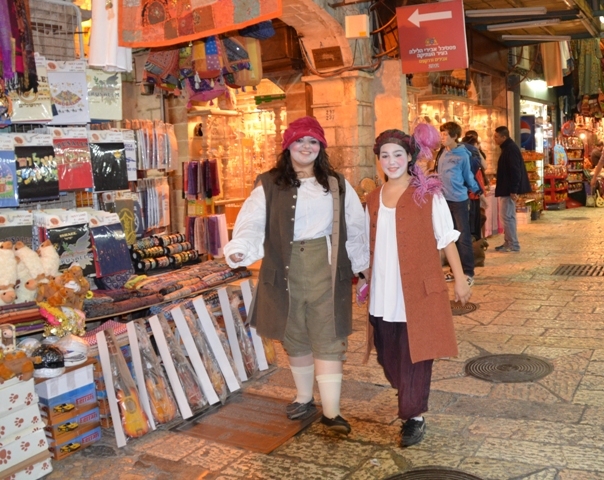 additional photos on The Real Jerusalem Streets Facebook page. I wish I understood the thinking of the Iryah on this one. The knights of old who they celebrate were marauding Jew killers and thousands died at their hands both on their way to and from the attempts at liberating the “Holy Land” and during their sojourn there. 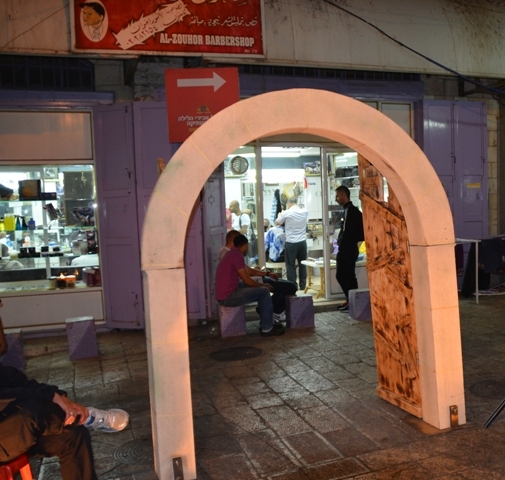 It just seems so incongruous to celebrate their time in the Old City no matter how cool the idea might have seemed at the planning stages. so the contrast now with all the excited family participation is all the more interesting. There are many programs the city promotes as “culture”, some I truly do not appreciate or understand. 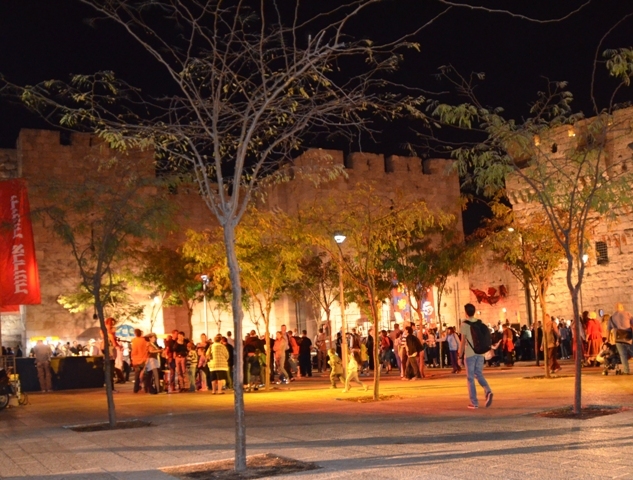 However, there are 1000s and 1000s of people out at night in the Old City, and if there is no violence it is not news, so we have to share the photos. 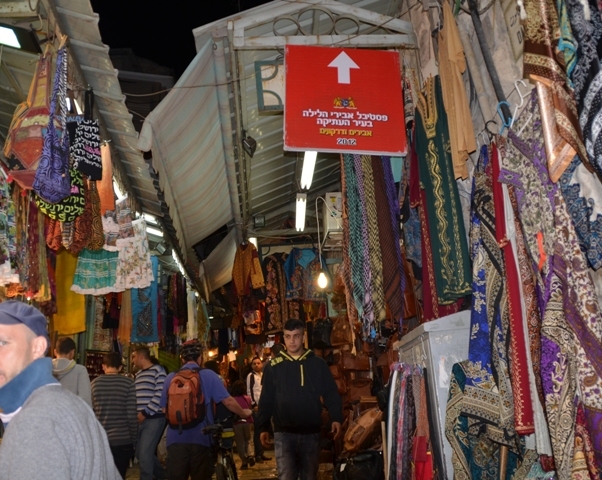 No criticism of your excellent reportage or photos (love strolling the streets of the Old City with you). This one has really got me stumped. 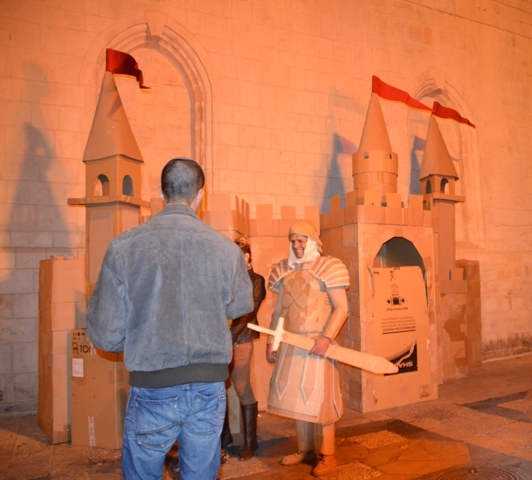 When I raised my concerns with one of the staff at the entrance to Shaar Yafo in 2010 the young lady concerned was blissfully ignorant of the brutal history of the knight’s sojourn in the Holy Land and it is that ignorance that is most disturbing. 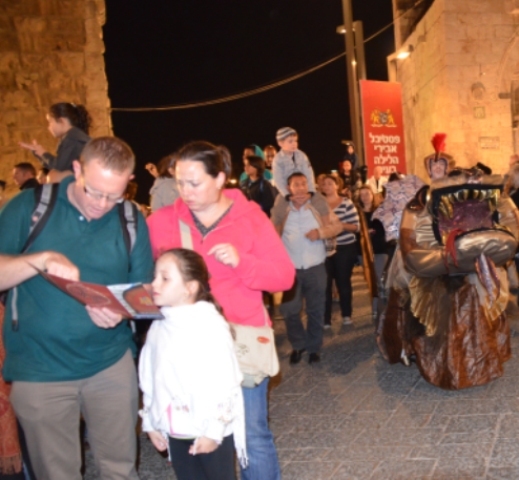 Happy families having a great time in the Old City is wonderful but can we really celebrate the Knights (and the crusades that brought them) without a very great cringe? 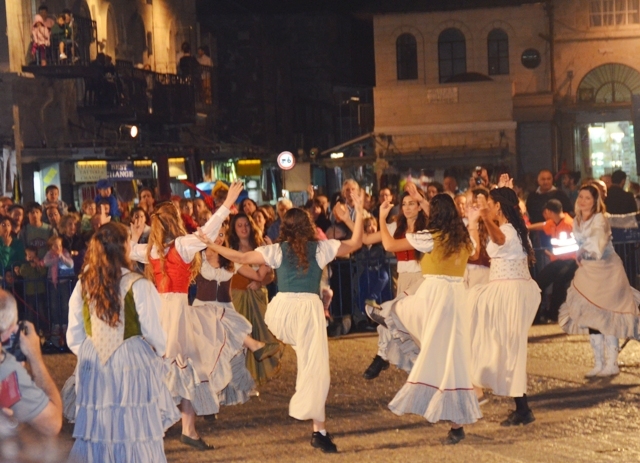 Tongue in cheek, how about a Cossacks evening with everyone riding horses through the streets pretending to run down and kill the happy families? 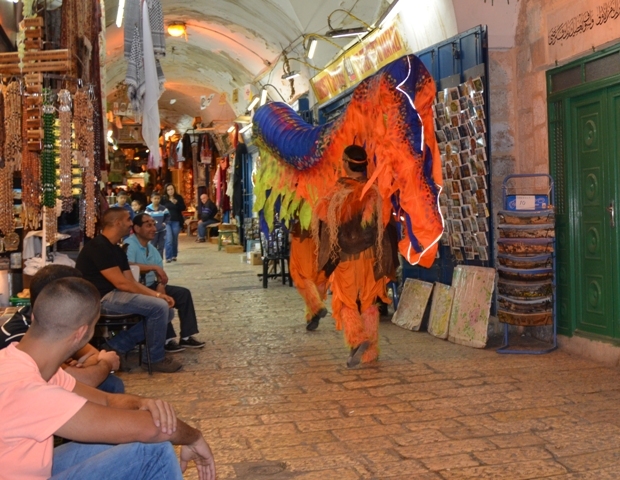 Absolutely wonderful pictures – so bright and colourfull – wish i was there strolling along the Old City!! 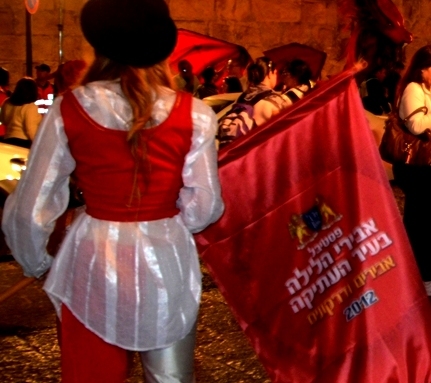 Maybe this event is a tikkun for the events of the knights in the past! 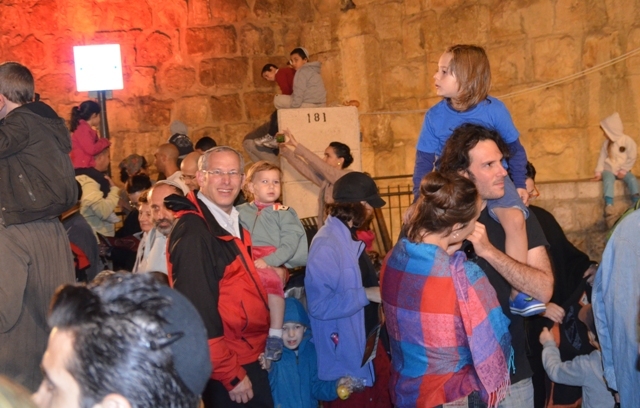 If you think about it, having all these people come and celebrate in peace and harmony is quite an accomplishment. 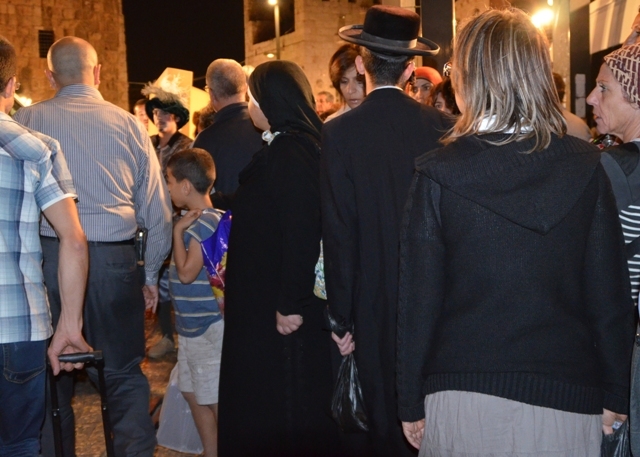 The photos of the old city with the celebrants is beautiful. Thank you for making this visible for us outside the country! Thank you Toby! It is sad that the media ignores positive events, no matter how large. It is even sadder that as 100 rockets are being fired from Gaza into southern Israel today, the media ignores that too.